Today, Samyang announced a new 85mm f/1.8 manual focusing len for APS-C E-mount cameras. It will start shipping in September for £319.99. Samyang Optics launches a new manual-focus lens for mirrorless shooters: The MF 85mm F1.8 ED UMC CS is designed for use with APS-C sensor mirrorless cameras in the following mounts: Sony E, Fujifilm X, Canon M, and Micro-Four-Thirds. It is competitively priced and light-weight. This medium telephoto lens inherits the renowned image quality of Samyang’s manual focus series and also boasts beautiful out of focus bokeh and availability for a variety of cameras. The compact and light-weight design offers the portability and comfort needed for a long day’s shooting. This lens would be the ideal choice for keen photographers who want to capture everyday moments in high-resolution. The Samyang MF 85mm F1.8 ED UMC CS has a host of features including its outstanding optical performance. Its wide range of uses include portraits and other close-ups such as food, as well as landscapes and many other situations. The MF 85mm F1.8 ED UMC CS lens is perfect for shooters who want to have more involvement and express their own characteristics through their images. 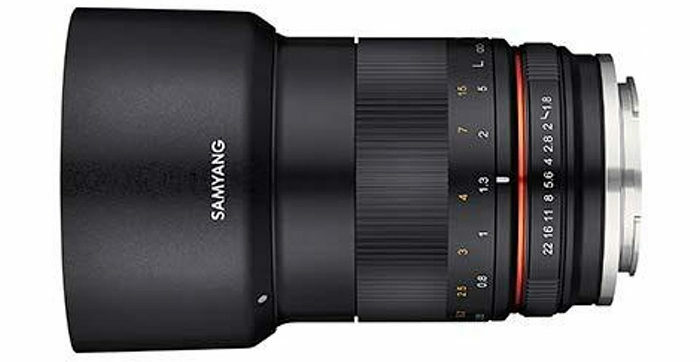 The Samyang MF 85mm F1.8 ED UMC CS weighs in at just over 300g and measures approximately 8cm long (without the hood and lens caps). Photographers can expect superb, emotional and unique images from this compact companion. Samyang XP 35mm F1.2 Lens Officially Announced! This entry was posted in Samyang lens and tagged Samyang lens on August 20, 2018 by admin.